Delivering a more powerful compression effect, these men’s Falke Ultra Energising Cotton Compression Socks stimulate and support tired travel legs and weary work legs, helping you to keep going as they encourage blood flow upwards and promote better circulation. Improved circulation combats achy legs and uncomfortable swelling, both dangers of sitting or standing for long periods. 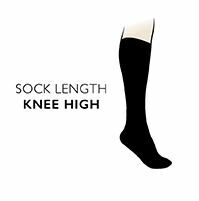 These soft, lightweight knee high Falke Ultra Energising Cotton Socks let your legs breathe, thanks to the cotton rich fibre blend, but also apply constant, mid-to-strong graduated pressure and support that refreshes and keeps you going. With an ergonomic design, including anatomically specific left and right shaping, and seamless toes, Falke Ultra Energising Cotton Compression Socks deliver a perfect fit and wrinkle-free legs for total,24-hour performance and comfort.